Interested in buying a car at a public auction in Tennessee? 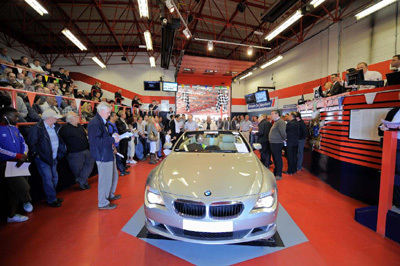 First of all, auto auctions are a lot easier than one may think – and more importantly, they are a lot of fun! Many car buyers can be intimidated by the auction process at first. With the information below, you will be ready to attend an auction and save tons of money on a used car or truck. What do I need to bring with me to the auction? Surprisingly little. First, you will need a current driver’s license(it does not have to be issued by the state of Tennessee). Second, you will need your form of payment(contact the auction first to verify that they accept your form of payment – most accept cash and major credit cards). For most auto auctions, that is all that you will need. Why are the cars so cheap? Is there something wrong with them? This is probably the most common concern people have with auto auctions. While there are many auto auction myths, it is important to remember who is usually the one spreading these myths: car dealers. Meanwhile, they continue to buy their own inventories at auto auctions so they can mark them up and sell you the same car on their used car lot for a lot more money. Now that it’s 2015, it is very easy for someone to run a VIN history report with their cell phone. No longer is it necessary to trust someone when they tell you that a car has not been wrecked or that the title is not salvaged. Anyone can effortlessly learn the history of a car almost right away. The reason the cars are so cheap at car auctions is that they move their inventory in bulk: some auctions sell thousands of cars a month to the public. Most of these cars are bank repossessions, trade-ins, title pawn repos, police impounds, or other sources of vehicles that involved a seller needing to sell the car quickly. As a public auction buyer, this factor works to your advantage. Do the cars sell for how much they bring in the auction now matter what, or is there a minimum price? Most auction cars will have a minimum “reserve” price, similar to eBay Motors. However, these reserves tend to be very low compared to the private or retail value of a car or truck. Also, unlike eBay, these reserve prices tend to be very flexible and are open for negotiation.